Some people say you can find anything you need on craigslist. And for Rob Zammarchi, the online bulletin board turned out to be the wellspring for a new children's music group and maybe -- with luck -- a television show. 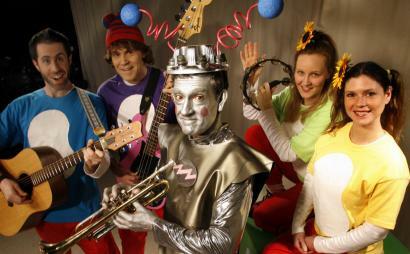 Not only did the Millis resident's ad draw adults willing to perform as a robot and as singing and dancing beans (yes, beans), it also recruited two TV industry insiders to produce a television pilot featuring the band they formed: Flooky & the Beans. In other words, Zammarchi got everything he wanted -- and more. Josh Shriber of Newton, who teaches young children music using the Music Together approach, joined the group as JoJo Bean. Patience Orobello, a nanny from Newton, had just the right cheery attitude to be Peppi Bean. Vic Lalli of Maynard, also a Music Together teacher, took on the persona of Flooky, a science-focused robot. Zammarchi and his wife, Emily, rounded out the group as BoBo Bean and Emma Bean. "The idea is that Flooky is a goofy, bumbling robot who is obsessed with technology. And the Beans, who live in their own organic garden, are trying to show him the beauty of nature," said Zammarchi. "But Flooky teaches the beans, too. He's a scientist of sound and he uses his electric guitar and synthesizer to teach the Beans about music, such as what's a happy sound and what's a sad sound." Flooky first surfaced in 1998. Zammarchi was in a rock band with Emily, and Flooky was one of what he calls the "cavalcade of characters" in his head. For fun, the pair recorded a cassette of kids' songs featuring the geeky robot. Then all was forgotten until their daughter was born in 2003. "Once we became parents, we kept discovering all this great children's music, so we figured it was time to revive Flooky," said Zammarchi. "We wrote a story about him and the idea just started to develop." Soon, they had plans to form a band and create a TV show. "The whole concept of nature-meets-technology has always fascinated me, and Flooky and the Beans seemed like a great way to show kids the benefits of both," said Zammarchi. By early last year, the band began rehearsing at the Zammarchi home in Millis. Meanwhile, the pair put their professional skills to use for the group. Emily, a marketing consultant and packaging designer for various companies, including Hasbro, developed the band's colorful look and website. Rob, an illustrator and animator whose clients include HBO, Nickelodeon, and Disney, developed animated segments about the troupe's adventures. Eventually, they rolled it all together -- music, skits, cartoons, and dancing -- into a TV pilot that they taped at the Medfield Cable 8 community-access studio. For now, they plan to perform in the area and run the first episodes on other area community-access television stations. They will play a concert Saturday morning at the Amazing Things Arts Center in Framingham's Saxonville neighborhood. "The idea is to develop a ground swell of support locally first," said Rob Zammarchi. After that, a Telly Award-winning film and television producer, Hans Hartman, who has created programming for Disney, will shop the show to TV networks with the help of Kristen Schrader, a former producer for NESN. Both answered the craigslist posting. "This is definitely a project approached with high aspirations," said Zammarchi. "But it's still a work in progress that's developing in public. Right now, we're testing how the concept connects with kids." So far, so good. The act seems to be winning over the preschool crowd, which is the target audience. "We pack in a lot of interactive stuff, like Flooky's 'Watch Me Now' song, where everybody claps, jumps, slides, and sings, and that gets them really excited," said Zammarchi. Flooky & the Beans, 11 a.m. Saturday at Amazing Things, 55 Nicholas Road, Framingham. Tickets $8. Call 508-405-ARTS or visit amazingthings.org.